If you have never had the pleasure of experiencing the Christmas Parade at the Magic Kingdom I hope someday you get the opportunity. 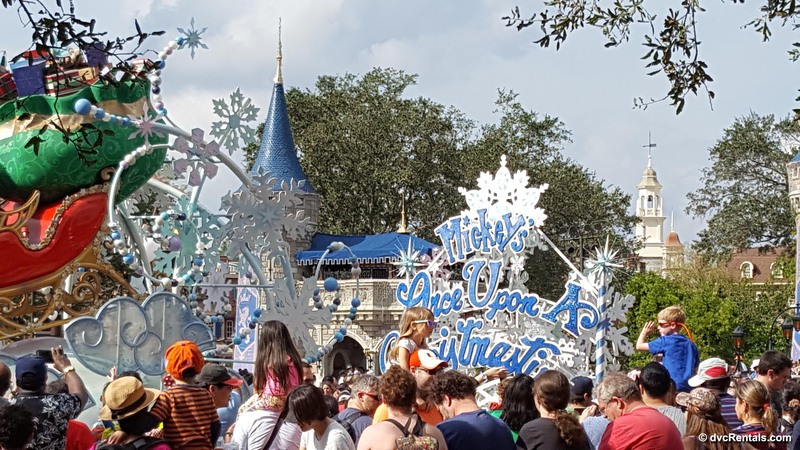 It truly is a spectacular event, with float after float of characters, as well as characters and cast members performing routines in the street as the parade passes by. If you have gone you know how wonderful it is, you also know (if it is Christmas week) how crowded it can be. I hope those who haven’t seen the parade will enjoy reading the highlights of the event. 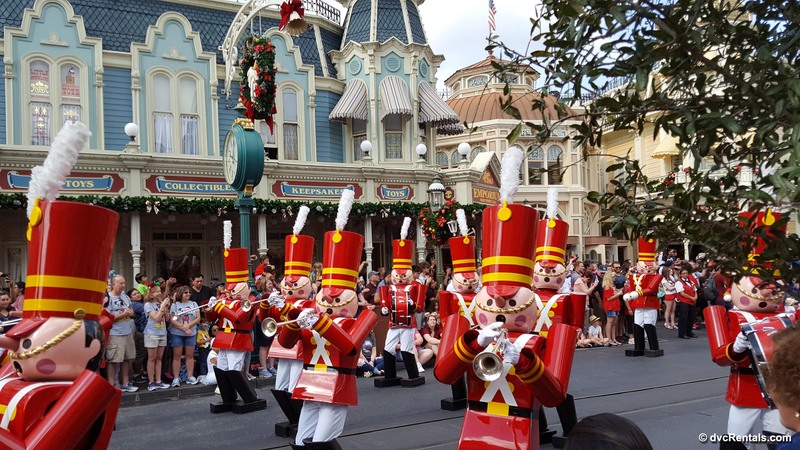 And if you do plan to go in the future, whether it be your first time or your 100th time, I hope this blog will offer you some tips on how to enjoy the parade even more and avoid the worst crowds. If you attend Mickey’s Very Merry Christmas Party, the after hours ticketed event, the Christmas parade is held at 8:30 and 11:00. Generally the later parade has less guests viewing than the early showing, as families with small kids often are gone by 11. Although you can expect crowds, since the number of ticket sold are limited, the number of guests watching will be less than those of Christmas week (when there are NO Christmas parties). I am going to concentrate the remainder of this blog on the parade during Christmas week, although most of the tips work for both the party and non-party Christmas parades. The parade itself is exactly the same, only the times differ. 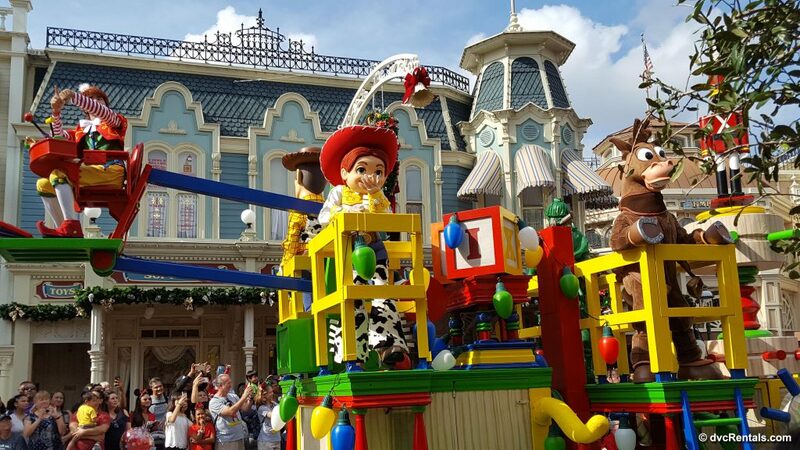 One tip to start off with: Once Walt Disney World has finished doing the Very Merry Christmas Party for the season, the very next day the daytime parade in the Magic Kingdom becomes the Christmas Parade. Generally, this happens 2 or 3 days PRIOR to Christmas day. For 2017, the last Very Merry Christmas party was 12/22, and on 12/23 the Christmas parade began in the Magic Kingdom. If you are able to take advantage of that one or two day window and attend the parade before Christmas week, it will surely have lower crowds. Next, be aware that there are two showings daily of the parade. The 12PM showing is always less crowded than the 3:30PM performance. 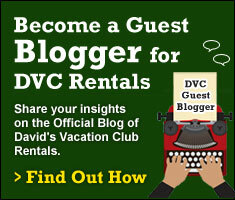 Another suggestion is to watch the parade from Frontierland. There are two reasons for this. Since many guests want to watch the parade from Main Street USA, that area is always PACKED. One year I was supposed to meet friends in Frontierland for the 12PM parade. They were a little late arriving and could not make it down Main Street through the crowd to get to Frontierland due to the crowds! Meanwhile I was plenty comfortable, having arrived 60 minutes before the parade started, got a great spot and never felt like the area was even close to packed. In fact this has become a yearly tradition for me, and I have noticed that an hour ahead is probably more than I need. Even with 30 minutes to parade time there were still quite a number of spots in Frontierland on 12/23 of this year when I attended. There are many spots to view from; my favorite spot is outside the Country Jamboree Attraction. The floats and the entertainers stop periodically to perform routines, and I have found that the area by the Country Bears is one spot they generally stop. Great photo ops, and it’s very nice to be positioned to see everything so well. 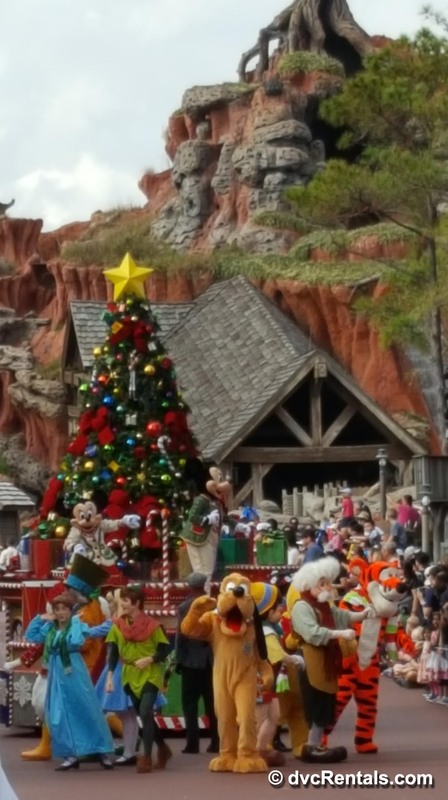 The second reason to watch the parade from Frontierland is because that is where the Christmas Parade originates. You will be the very first guest(s) to see the parade as it makes its way down the street, and when the parade has passed by you can ride the attractions in Frontierland and Adventureland with little or no wait, as most other guests will still be waiting for the parade to arrive further down the route. But wait! 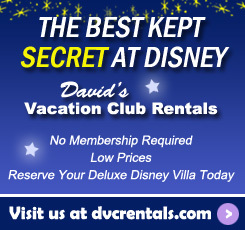 What if you don’t want to go on any rides after the parade passes by, what if you want to leave the park? How do you get around the parade if you don’t want to wait for it to go to the end of Main Street and then backstage? You have to be sure you are on the left side of Main Street as you exit the park. If you are on the right side you will be blocked by the passing parade from crossing over towards city hall (and the exit on the right). So walk behind the castle into Tomorrowland. Come around to Main Street and stay on the left, (walking through the jewelers and the bakery if you want to avoid the crowded sidewalks. [Cast Members do their best to keep the walkways clear, but it can be challenging at times]). Keep bearing left at the end of Main Street, passing Tony’s Restaurant and the Mickey/Minnie Meet and Greet area. Exit through the left side of the tunnel and voila, you are out! The parade itself is a fantastic mixture of music, floats, dancers, and excitement. 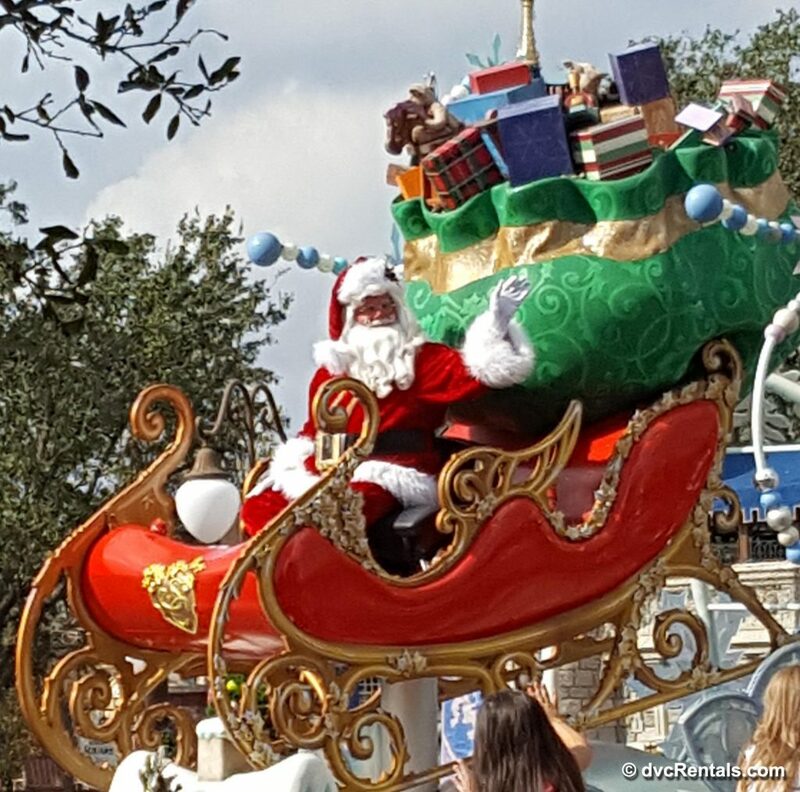 It starts with Mickey and Minnie on a beautifully decorated float wearing their holiday finest, and ends with Santa Claus joyfully waving to the crowd from his sleigh. In between the Seven Dwarves will dance, as will Reindeer. Giant Toy Soldiers march down the street in sync, and do various formations as they march. Each individual float is done up with Wreaths, Toys and beautiful colors, and each is decorated as a tribute to the characters on the float. 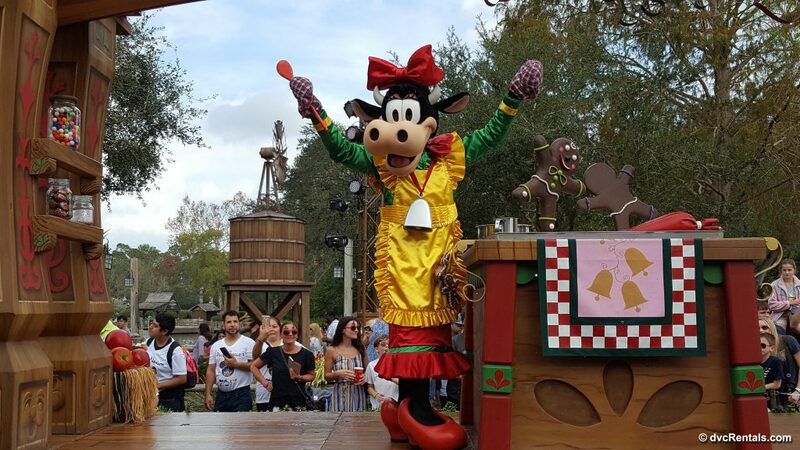 There are an extraordinary number of characters in the Christmas Parade, some who you see only on special occasions, many in special costumes for the occasion. 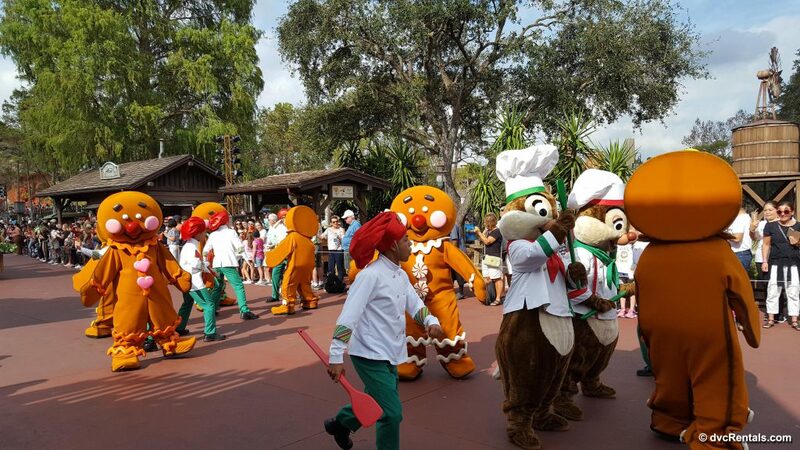 (The parade has not changed dramatically in quite some time, but they have added new characters through the years). 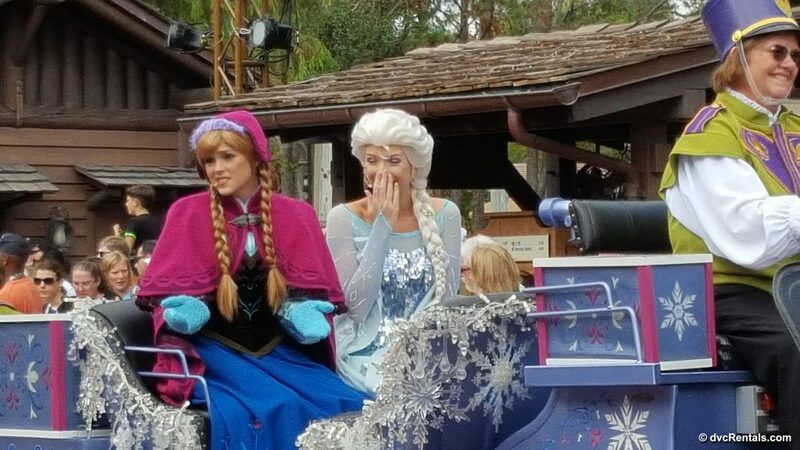 In addition to the dwarves, reindeer and Toy Soldiers I mentioned above, for the past few years I’ve seen: Alice in Wonderland; Woody, Jessie and Bullseye, Clarabelle Cow, Almost all the “Official Disney” Princes and Princesses; Anna, Elsa, Olaf and Kristoff along with cast members who “ski” along with the Frozen float; Goofy; Gingerbread Men who dance with Chip and Dale; Bo Peep; The Mad Hatter; Vanellope; Tigger and Pooh; Pinocchio and Geppetto, Peter Pan and Wendy; Mary Poppins and Burt; Donald Duck; and very adorable dancing reindeer. The emphasis of the Christmas Parade is on being Merry and Festive and having fun. The numerous dance routines that are performed along the way are fascinating to behold. The cast members give it their all. 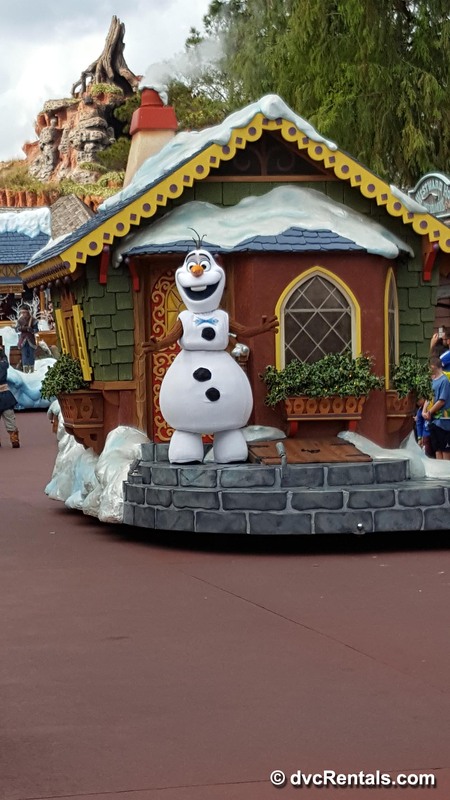 The ones who are walking or dancing by (as opposed to being on floats) will high five guests along the way, and that interaction increases the fun. Along with the Halloween parade and the now defunct Spectromagic, I could watch the Christmas parade over and over and never tire of it. It brings a smile to my face each and every time. One thought on "Christmas Parade at the Magic Kingdom"
I didn’t even know that this existed until we stumbled across the second half of the parade last month. Thankfully, we saw Santa in his amazing sleigh! Christmas is so magical at WDW!